While I’m not in a position to rank the relative quality of each of these state’s adult education systems, I can say with some confidence that most people in the field consider the systems in Massachusetts, Minnesota, Pennsylvania, and Washington to be relatively robust, high-quality, and/or innovative. Interestingly, as you can see from this chart, all of these states count a large proportion of volunteers among their workforce. 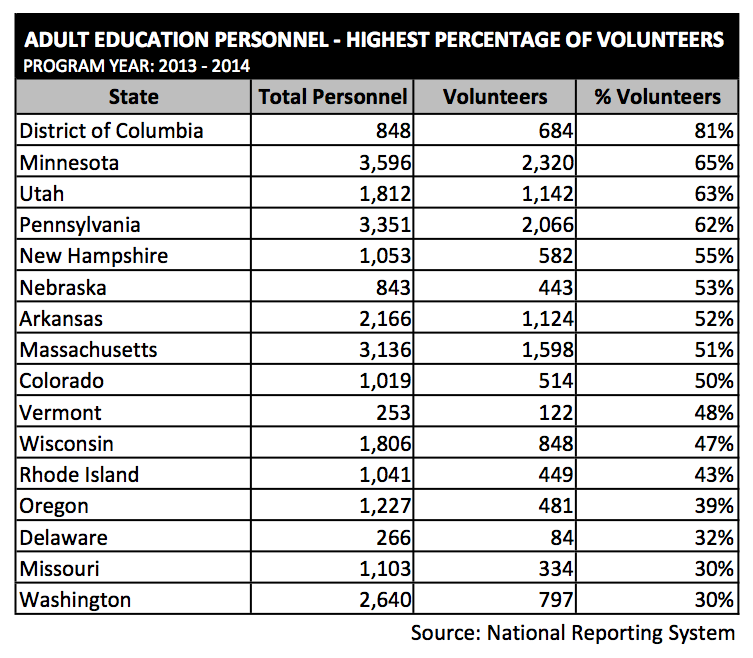 In Minnesota, volunteers make up 65% of their adult education workforce. My guess is that many people would be surprised to see so many volunteers represented among the workforce in these states because they view a large proportion of volunteers as an indicator of a relatively poor system. But while the NRS data is not the final word on adult education staffing (programs only report personnel who are administered under their adult education state plan and who are being paid out of Federal, State, and/or local education funds), it looks to me like there is probably no relationship at all between the proportion of volunteers in a state’s adult education workforce and the quality of it’s adult education system. It would be interesting to learn more about the role of volunteers in those states that depend on volunteers to such a large degree.